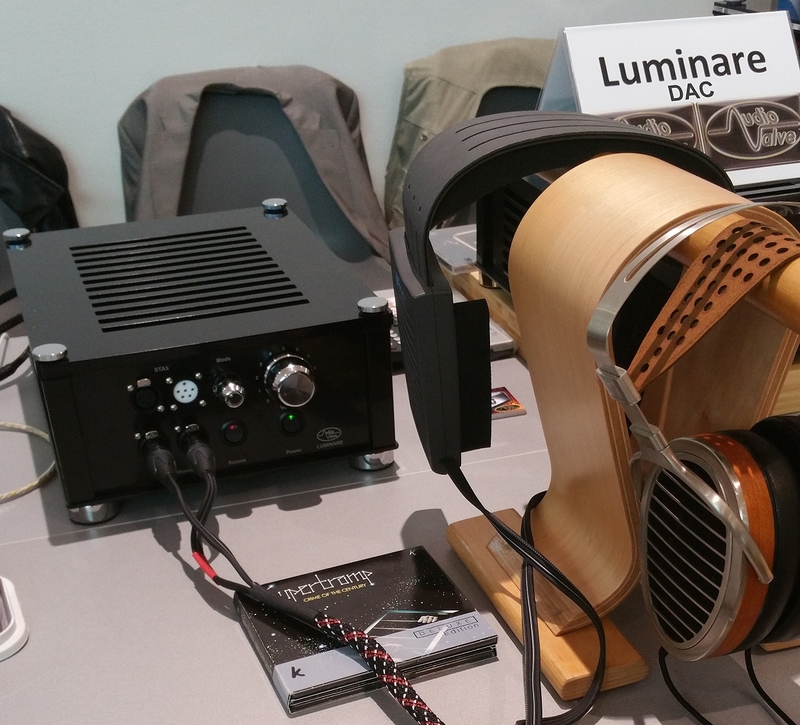 The Audio Valve Luminare is currently one of the best DAC / headphone amplifiers in the world. 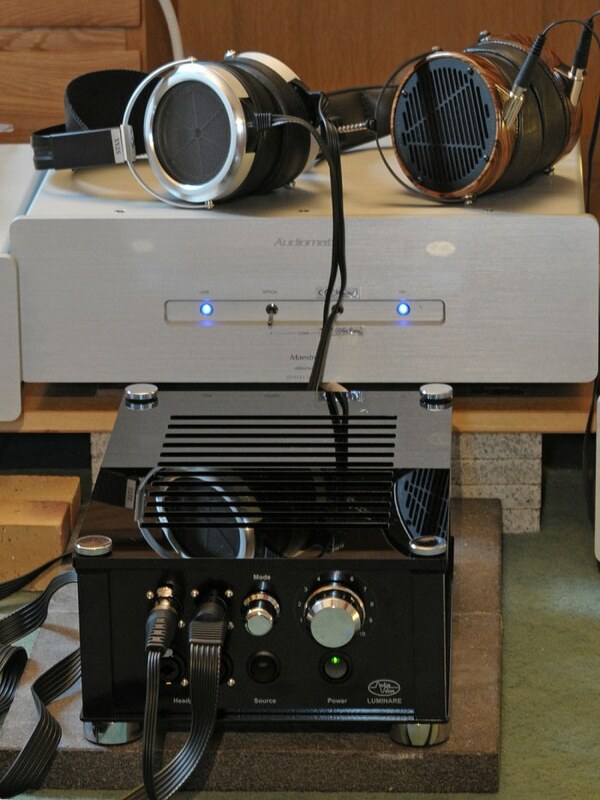 The AudioValve Luminare/DAC is a supurb tube headphone amplifier and DAC capable of driving Electrostatic, Planar Magnetic and Dynamic headphones to their full potential offering state of the art results. 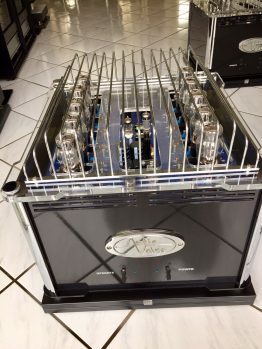 AudioValve puts most of their budget towards the sound quality of their design and components rather than all of the audio jewelry and marketable designs featured by some of the comparable sounding amplifiers on the market. On sound alone it outclasses its price point, as for performance, design, fit and finish it far exceeds our expectations and represents a truely exceptional product at double or triple it’s price catagory. 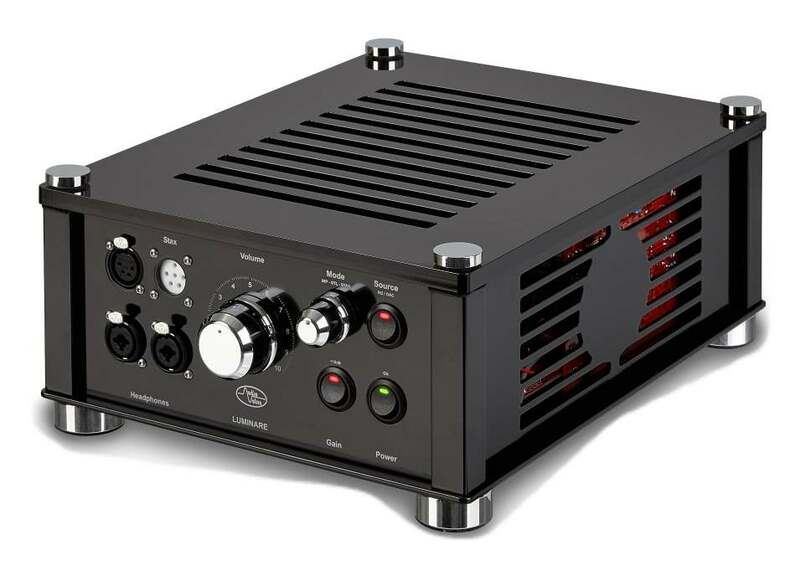 Sound wise this amplifier delivers great tonality, world class 3D sound stage, a noise floor on par with all but the very best valve based amplifiers, and macro and micro dynamics in spades. 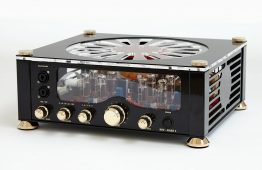 The sound quality of the Luminare is of absolute top reference level for a headphone tube amplifier. 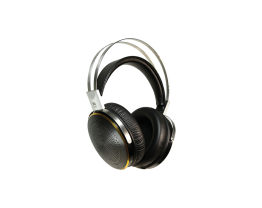 The pros to this are a very low noise floor, low distortions, high frequence range, high damping, very natural and musical tonality, wide impedance matching, perfect open soundstage and so on. 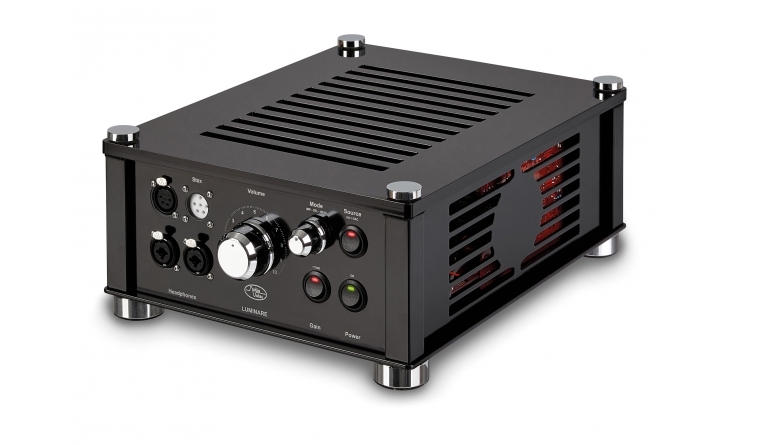 This amp isn’t for the weak of heart – it is an audioholic’s dream. Highly recommended is an understatemen. 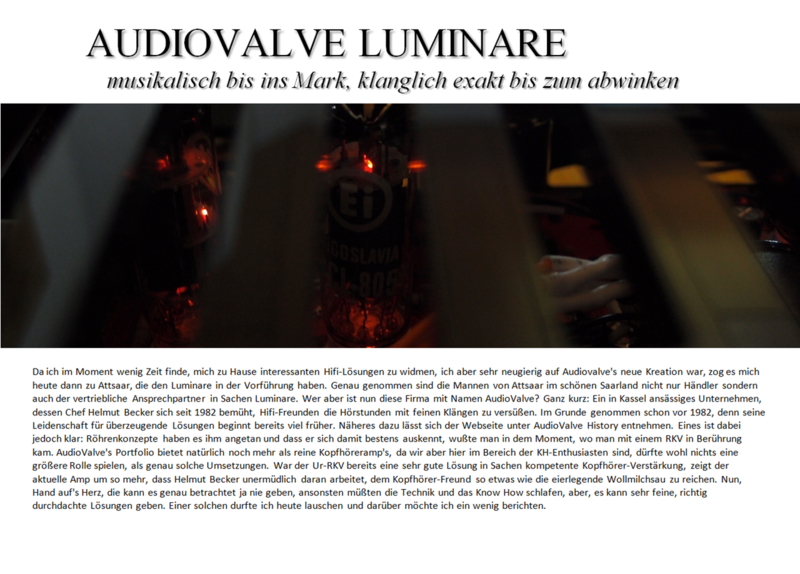 Additions to the Luminare to listen HIGHRES files like …..
AudioValve offers an in-house DAC developed by Manfred Penning. The description can be found under PRODUCTS / DAC. 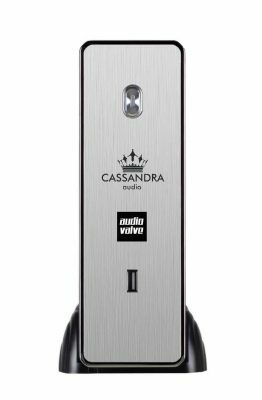 For those who do not want to play their HIGHRES files via our DAC, AudioQuest now offers an inexpensive option with the „DRAGONFLY“. This USB – DAC can also be connected to an iPhone with the help of an adapter cable and who owns a TIDAL subscription – which now also plays MQA Masterquality Files – really hears music at the highest level even for a small fee. So, the DragonFly on the one hand via the adapter cable to the mob phone, the other side of 3.5 mm jack in the analog input of Luminare and enjoy the maximum sound quality its amp. you had consciously chosen to Luminare. 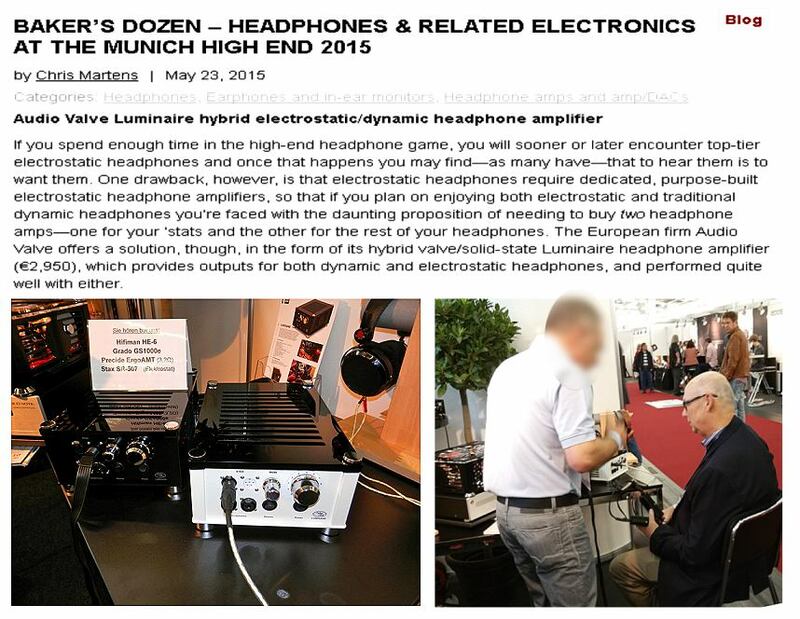 Why Audeze had probably done it – everyone knows the answer ….. I do not really know why I have driven this project forward not many years ago. I think I was busy with a lot of other developments as well as trivial things like earning money for example. 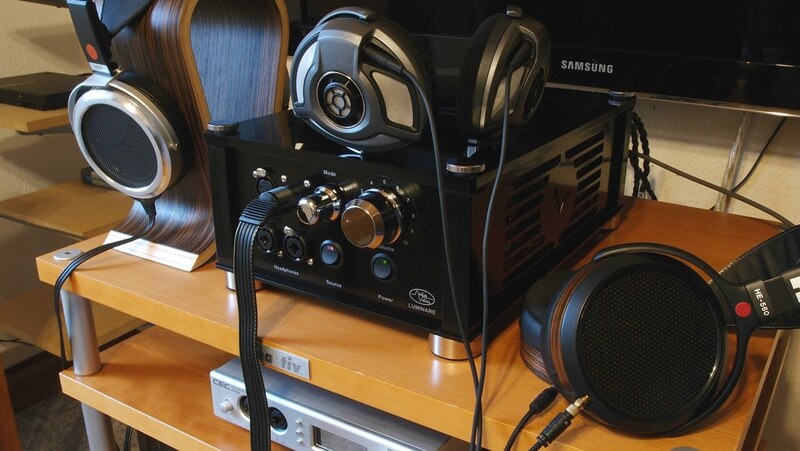 Perhaps mine is simply unaware that their headphones and amplifiers are experiencing a large hipe for years. 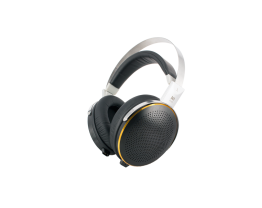 Anyway, the beginning of 2014 resulted in discussion with colleagues that I would have some products in my program that seemed almost ideally suited to put with the requirements of the headphone market apart. 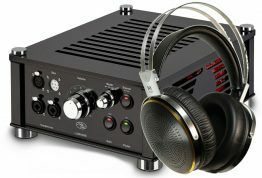 First, the IMPEDANCER befell a technical revision, it was expanding the range of applications for the RKV Mark 2 significantly, especially as a female teflon connector for headphones STAX was inter alternates. 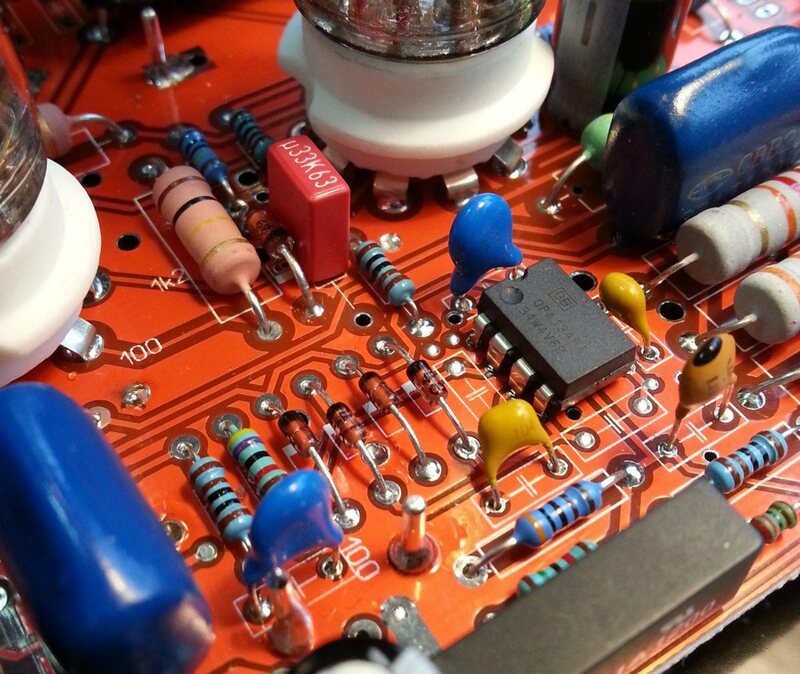 The bias voltage was obtained from the voltage signal, so no external power supply is in advance required. VERTO was born and VERTO laid the foundation for all further considerations in this topic, culminating now in the product with the name LUMINARE. I can excuse at this point only for me actually that I started so fundamentally important development in the headphones sector so late (I slept through) and had thus deprived the public a potentially groundbreaking product. Many of you have their money invested now possibly poorly because there was nothing else on the market – that really am sorry. But now back to Luminare. It seemed to me as the basis for such a project, the OTL circuit of the RKV downright awesome. 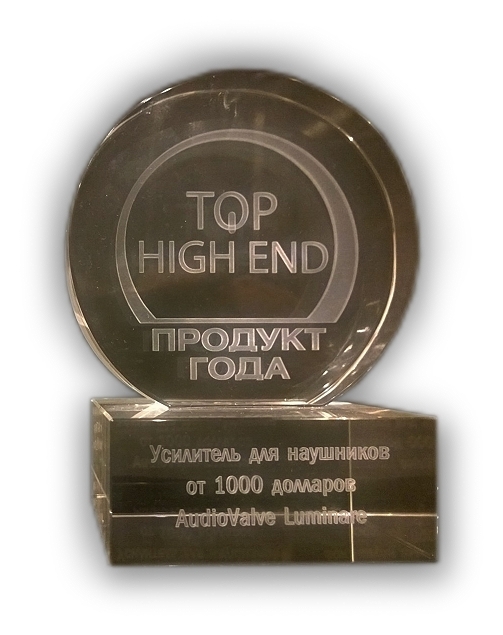 First, they had already claimed stable over decades in the market and on the other they had characteristics that should prove to be just the Luminare be extremely efficient and more full development. There would be for example the superior damping factor, low internal resistance, high bandwidth, and not least the low harmonic distortion he always particularly distinguished the RKV. 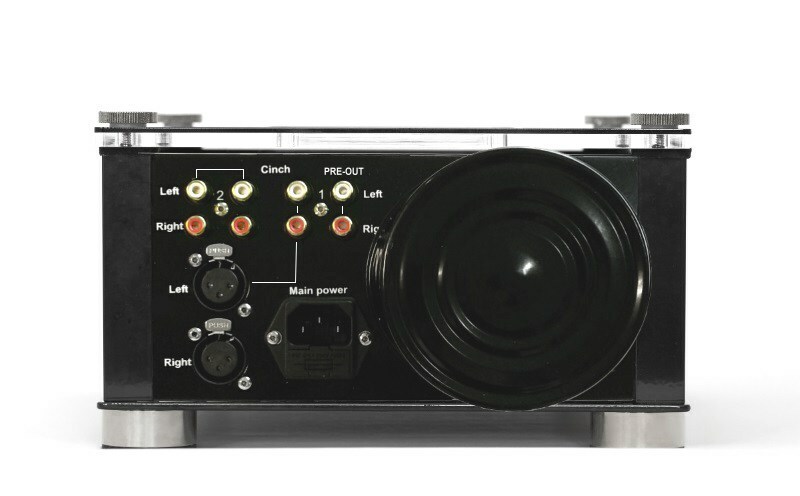 Now it was in principle „only“ about output transformers so be interconnected in the OTL principle, which can be obtained if possible upright with transformer all these benefits. 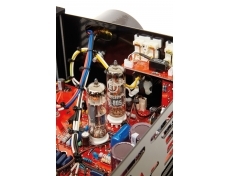 The advantage to couple a outpt transformer to an OTL circuit is that the repercussions and influences on the circuit itself ( either headphones or transformers ) are considerably lower. And this brings a projection on presence in the music, the listener will appreciate very quickly. Everything else on this project was for me then just „routine“. 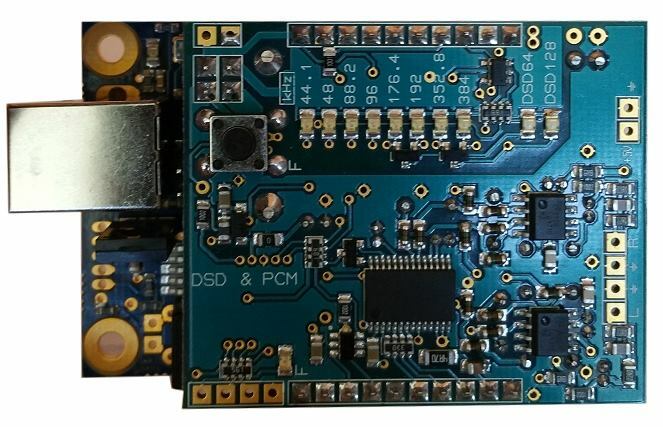 A new circuit board develop, expand the circuit according to the light of all electro – physical principles and my over 45 years of experience in this topic. The initial work on amplifiers for electrostatic headphones, ranging in AudioValve back to the year 1984. 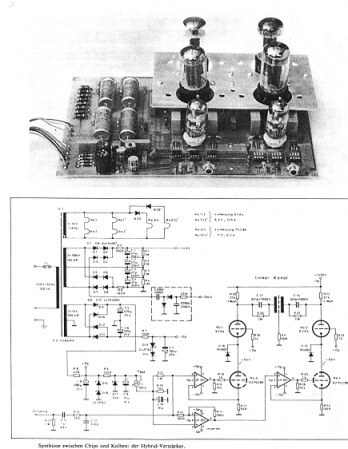 For this period Becker developed a stereo signal modulated constant current source realized with tubes of the type 6CK4, Headhpone for Jecklin float (s. diagram). 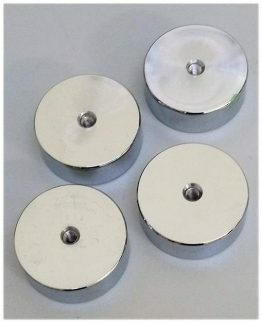 The principle worked very well and was sold at the DIY scene and also submitted for a patent. Becker had at that time, however, his entire creative force for the development of medical laboratory equipment for hematology, to determine the clotting times of blood plasmas such as Quick, PTT, AT-III, etc. dedicate came across Europe in every hospital to use (blood coagulation ball – method). 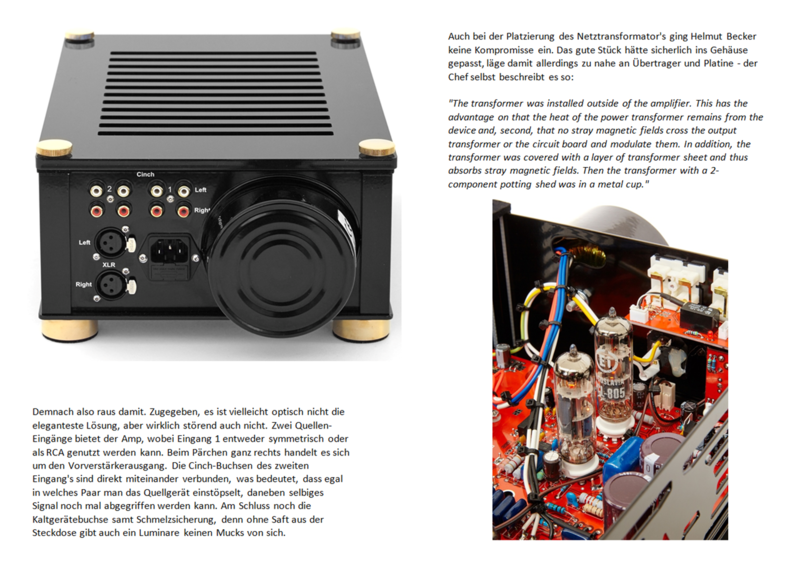 For this reason, the passion for audio electronics unfortunately had to again and again stand back and „ESV“ never went into production. 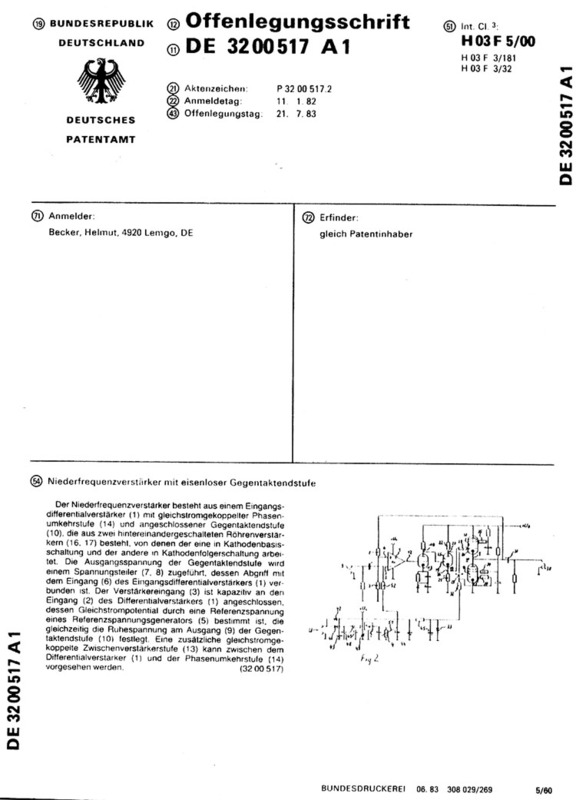 But documents from this early history prove that Becker with completely unorthodox creative solutions to progressive ideas for converting audio tube concepts – also worked for electro static Headphones – and since everything to be able to take park in claim without a university measuring instruments. 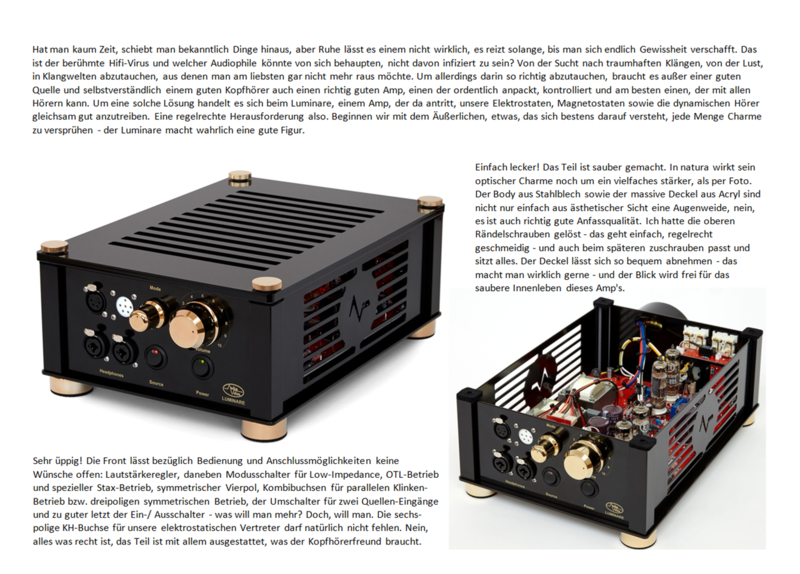 So it’s not that Becker has dealt only recently with the topic headphone amplifier, but for over 30 years. 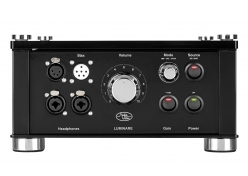 Note: Thus is L U M I N A R E the ONE AND ONLY headphone amplifier on the market that is able to drive all standard headphone loads, starting from 3 ohm up to 145.000 ohms. 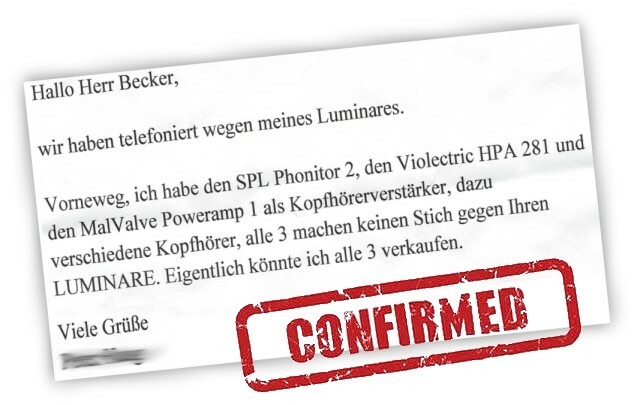 We ask anyone who would like to add something to the user manual of homemade experience with Luminare to a corresponding text note to Mr. Becker. 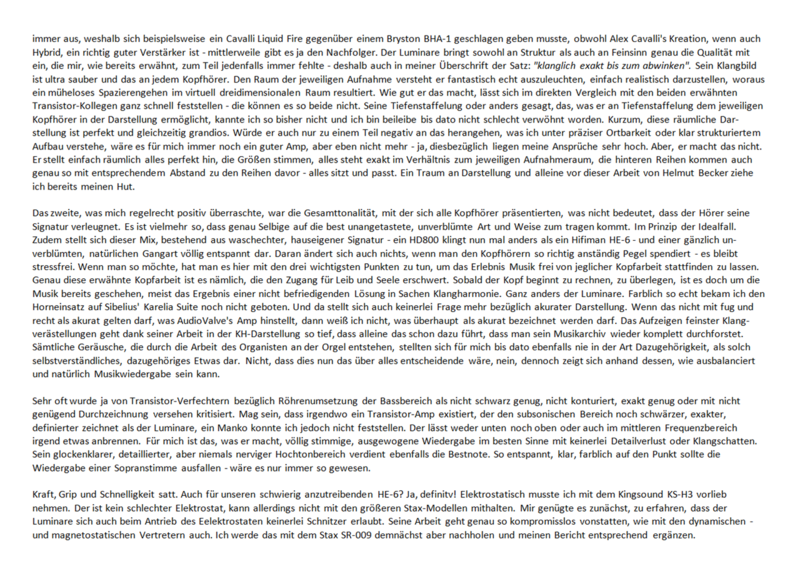 A good friend of mine (Ralf Ohmberger – Germany) has explained the theoretical concepts to the RKV basics in various treatises. People what have fun has got to the theory, this may like to study for better understanding its theme. 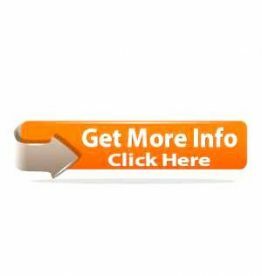 Suivre les discussions du forum pour plus d’informations au sujet du Luminare ! 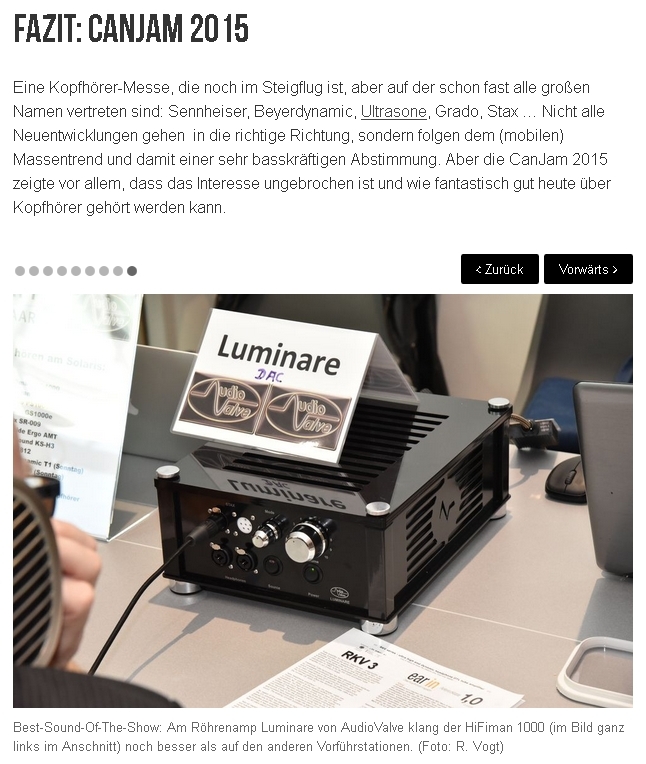 Follow the forum posts for more information about Luminare ! 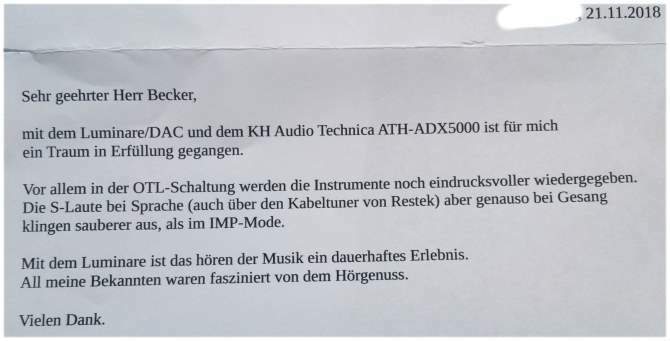 Egal ob mit hoher oder mit niedriger Impedanz, mit hohem oder geringem Wirkungsgrad, egal ob dynamisch oder Magnetostat – keinen der angeschlossenen Kopfhörer habe ich bisher so erlebt, wie über den RKV 3, da öffnen sich tore zu neue welten. 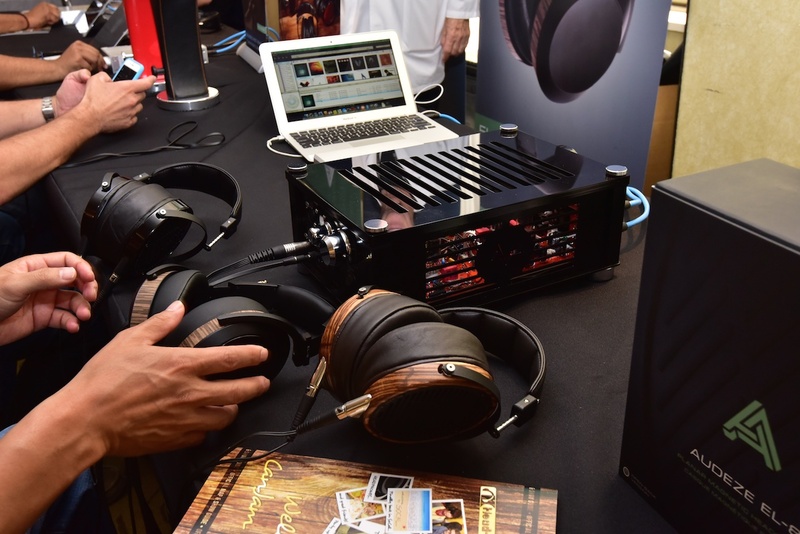 No matter if high or low impedance, high or low efficiency, whether dynamic or magnetostat – none of the connected headphones I have ever experienced so how about the RKV 3, it will open doors to new worlds. Aucune importance si le casque connecté présente une haute ou une basse impédance, une sensibilité élevée ou faible, qu’il soit électrodynamique ou isodynamique. Quel que soit le casque utilisé, je n’ai jamais connu un tel résultat que celui obtenu avec le RKV 3. Il ouvrira les portes sur de nouveaux mondes. 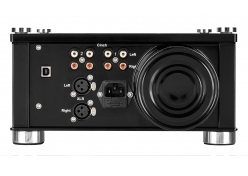 Mode: STAX only ~ 60dB ( 32dB +10 dB switch gain increase +15.5 dB galvanic coupled balanced step up tranformer ) all other jacks supported too !!! The output impedance at Luminare with negative feedback (physical concept: closed loop) is defined as follows. Example: The OTL mode provides Luminare 1V without load resistance and 0.998 V at 60 ohm load resistor. From these data you calculated easily approximated the output impedance of the amplifier for this load resistance 0,12 ohm. 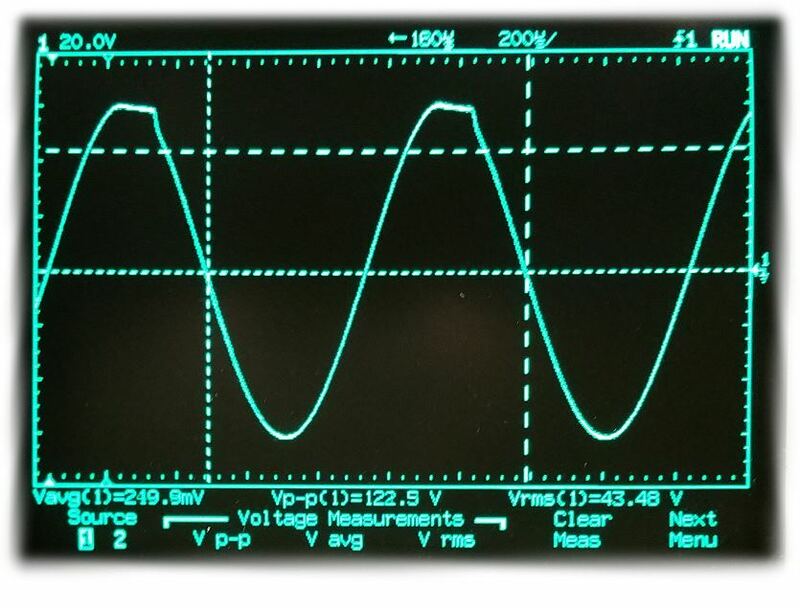 The fact of wanting to determine the output impedance by incorporating the tubes, is simply nonsense. 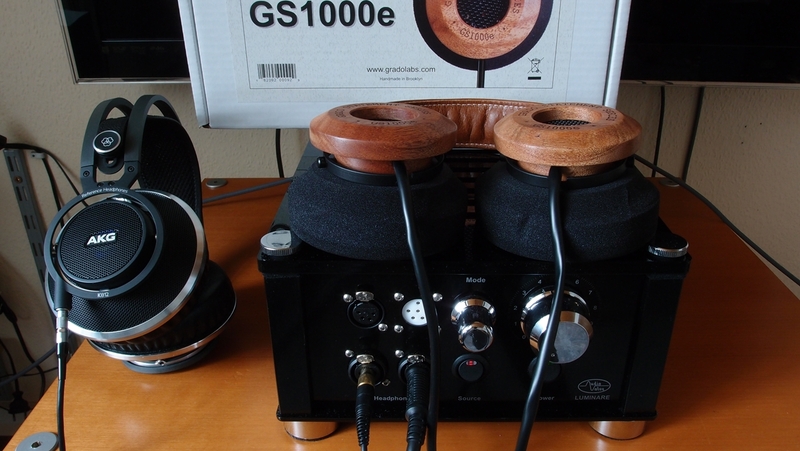 Explanation of the + 10 db gain switch circuit for Stax mode. 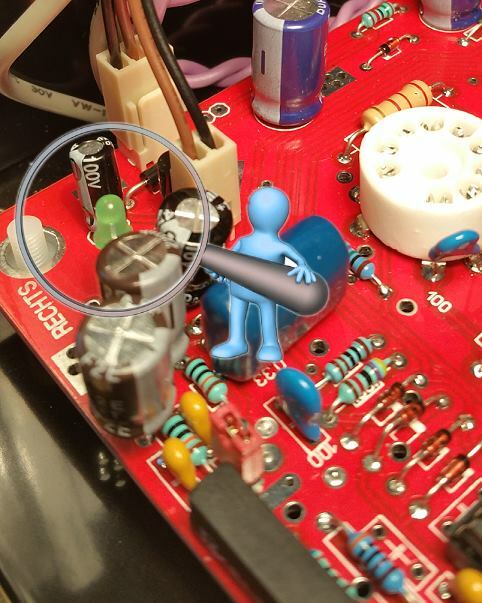 A green internal LED of the front left on the board signals, that LED on gain increased by an reed realis up to +10 db. 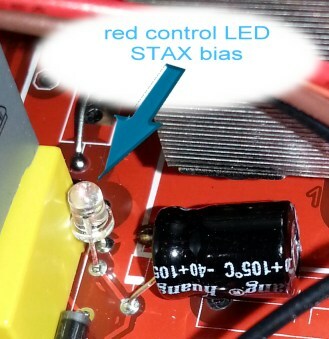 This white LED indicates when the bias voltage built up for the Stax headphones and stable. If you turn on the amplifier, reducing the volume and wait until this red LED goes off. 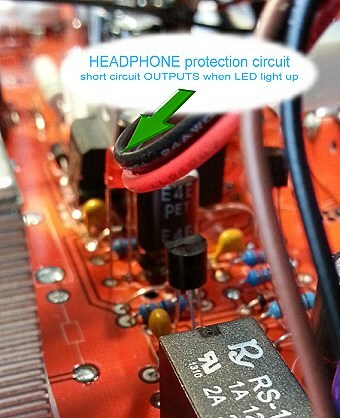 As long as this red LED seems light up, all outputs of the amplifier is short-circuited and thus protect the headphones when the amp load or un – load the internal caps. 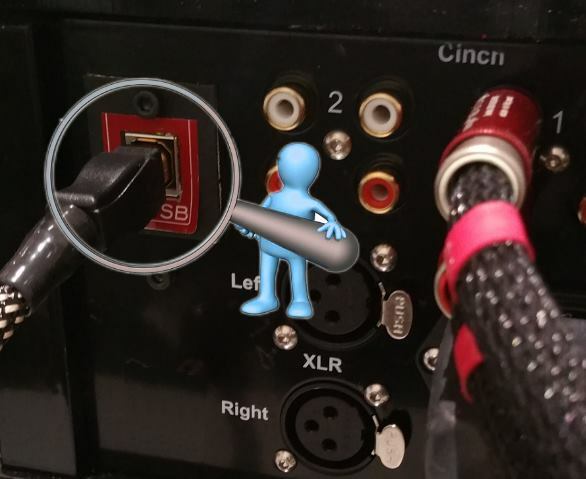 This is always the case when the amplifier ON and OFF switches. The transformer was installed outside of the amplifier. This has the advantage on that the heat of the power transformer remains from the device and, second, that no stray magnetic fields cross the output transformer or the circuit board and modulate them. 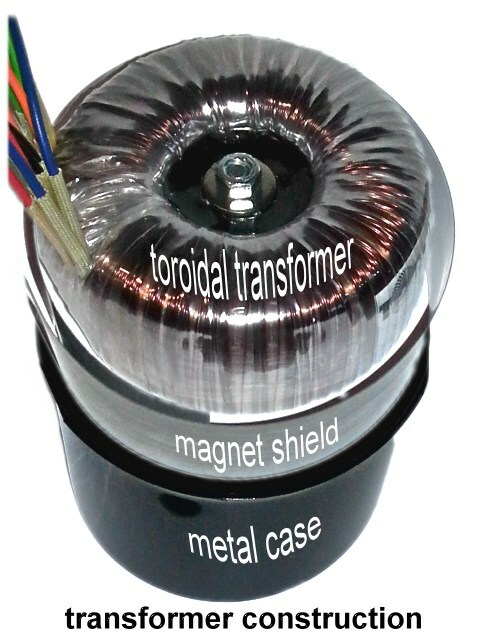 In addition, the transformer was covered with a layer of transformer sheet and thus absorbs stray magnetic fields. Then the transformer with a 2-component potting shed was in a metal cup.